You can read more at Microsoft Support web site. We experienced small issue upgrading to Exchange server 2013 CU3 (does not apply to clean install, only upgrade from previous Exchange 2013 builds). Upgrading to CU3 blanks ExternalUrl parameter of ActiveSync virtual directories. Luckily existing ActiveSync devices will continue to work, new devices would require manual configuration if you will not configure value for ExternalUrl parameter. To set value of ExternalUrl parameter use cmdlet or via EAC. Microsoft Lync Server 2013, Debugging Tools installation or uninstallation requires that Microsoft Visual C++ 2012 x64 Minimum Runtime - 11.0.50727 Package is already installed. Either use Setup.exe for installation or run Vcredist_x64.exe included with the product to install the redistributable. Uninstall current version of Microsoft Visual C++ 2012 x64 runtime. Install Microsoft Visual C++ 2012 x64 from Lync installation media. 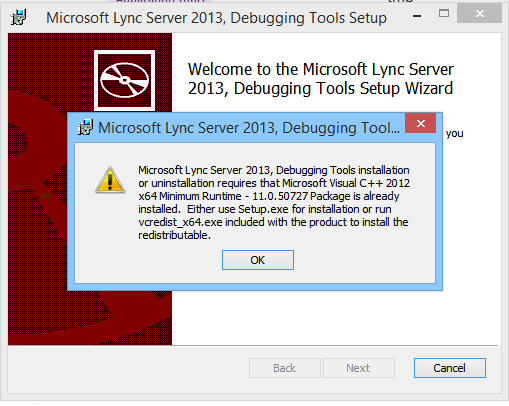 If you just need Snooper for example, you can extract Lync Server 2013 Debugging Tools. Microsoft temporary removed MS13-061 security update for Exchange Server 2013 due to bug with content index. After installation you will notice Content Index for mailbox databases failed and service Microsoft Exchange Search Host Controller service is renamed. For customers that already deployed updated, Microsoft provided KB article with steps to resolve issue. Microsoft just released a bunch of updates for Microsoft Exchange Server 2007, Exchange Server 2010 and Exchange Server 2013. It’s important to deploy updates since they contain security fixes. Due to issue with the loss of public folder permissions Microsoft updated Exchange Server 2013 CU2 update (build number 15.0.712.24). If you have already deployed original CU2 (build number 15.0.712.22), you should upgrade to 15.0.712.24 (potential security updates released for CU2 will be dependent on this build). You can upgrade to CU2 (.24) via GUI interface or execute setup.exe /m:upgrade /IAcceptExchangeServerLicenseTerms from command line. It’s time to start transition to Exchange Server 2013. Today Exchange Team released CU1 which we were all waiting for some time! I finally have some time and nerves to successfully migrate my blog from Community Server 2007 to BlogEngine.NET. It was a bit painful because of superb options in CS2007. Thanks to everyone helped developing BlogML converter for Community Server! Here is a screenshot of old blog. 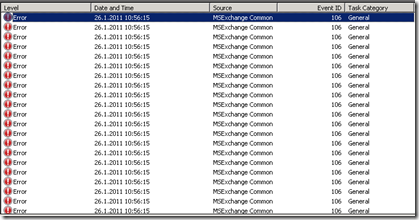 You might experience some errors in Application log after Microsoft Exchange RPC Client Access service is started. I saw this issue on servers with only Mailbox Role installed. Although CAS role has also service named Microsoft Exchange RPC Client Access I did not see this issue if CAS Role is installed on server without Mailbox Role. There is nothing to worry about this error. Microsoft published article KB982679 - Event ID 106 is logged when you start the RPC Client Access service on Exchange Server 2010. 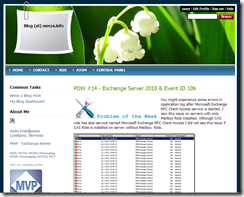 This problem occurs because the performance counters of the RPC Client Access service are not installed when you install only the Mailbox role on an Exchange Server 2010 server. 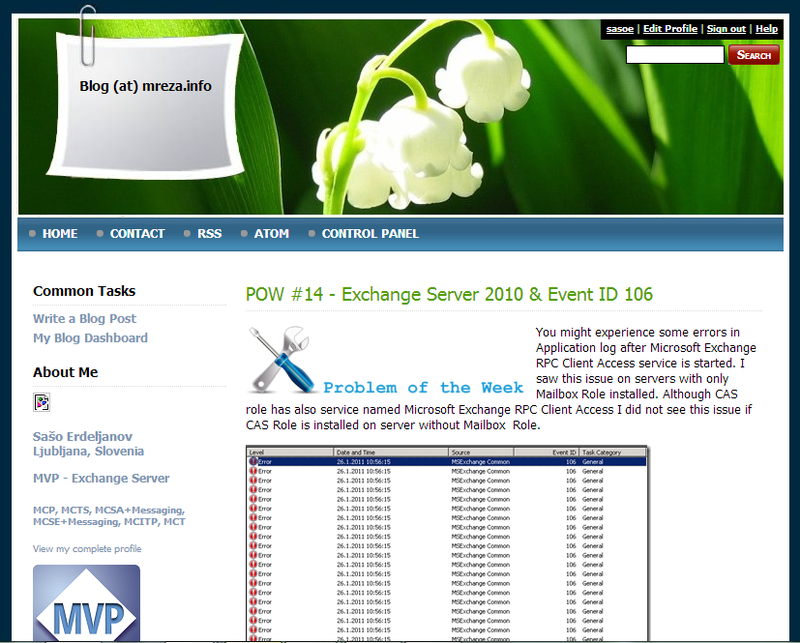 However, this does not affect the functionality of the Exchange Server 2010 server. 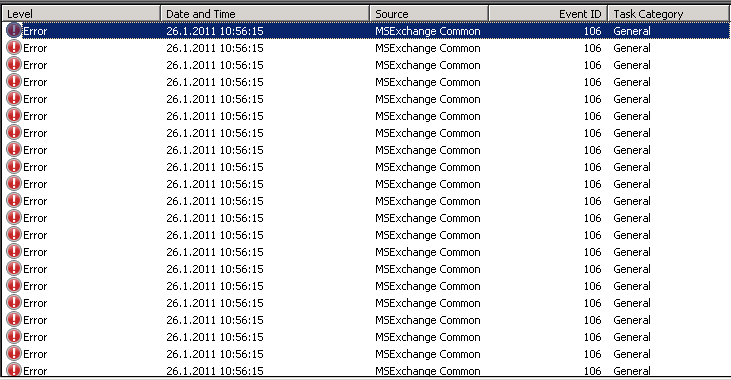 It’s not so pretty to see many errors in Event Viewer after restarting Microsoft Exchange RPC Client Access service. Let’s try to manually add RPC Client Access performance counters. New-PerfCounters -DefinitionFileName "C:\Program Files\Microsoft\Exchange Server\V14\Setup\Perf\RpcClientAccessPerformanceCounters.xml"
Restart server or Microsoft Exchange RPC Client Access service.